This is an early Western from Sam Peckinpah, who would go on to make modern classics, such as The Wild Bunch. Here he plays much it much safer with a knockabout, almost comedy, entry in the genre, with amicable characters and a rather predictable plot. It would seem to fit in well with the later John Wayne movies, with it's watchable laziness and ageing leads. I do enjoy Joel McCrea's films. He had such a natural, dumb honesty that made him so brilliant in Sullivan's Travels or the early Hitchcock movie, Foreign Correspondent. He is also I think a much better actor than he let most people believe! Randolph Scott plays opposite him and is always value for money. Ron Starr is the young gunslinger who needs a regular lesson in respect and as you'd expect with a fun brawler like this, respect is normally a punch in face! Mariette Hartley is the weakest character as the naive girl entering into a hasty, ill-judged wedding to slimy villain James Drury. She seems to get his brother too, a typically good Warren Oates. It was here the alarm bells started to go off. I'd thought the Elsa character the weakest, but there was something else. She was getting used and it was leaving a nasty taste in my mouth. This was still coming across a fun Western, yet if you thought about it for any length of time, the events didn't fit in anymore with the supposed light nature. I'd thought Peckinpah, relatively early in his career, was taking an easy route, but actually this is one of his cleverest and most manipulative films. He was known for his challenging depiction of violence, cruel fates of characters and a fascination with death. His Westerns were always set at the end of the wild west, with cowboys realising their doom couldn't be far off because they were so outdated and going about their business with a tinge of melancholy. Ride The High Country is only different because of it's subversive tone, taking the plot from fun, to uncomfortable, to tangible regret. It's still ultimately predictable, but certain choices by some characters and a stark depiction of death add some steel to the plot, especially as it's always played straight and the direction is very solid (no slow-motion blood letting here). By promising the viewer such derivative fun yet delivering it with a nasty punch to the gut, he made a masterful film with an albeit awkward tone. It might be Rio Bravo's cousin, but it's the one the family don't talk about because of the nasty streak. I highly recommend it to anyone who likes the Anthony Mann sort of Westerns and to anyone who usually dismisses them as too frothy. Plot:In 1997, Living with Lions - the behind the scenes story of the British & Irish Lions Tour of South Africa - was acclaimed as one of the greatest sports films ever made. Now, 12 years on, the British & Irish Lions were back in South Africa and so were our film crew, recording every minute of what was one of the greatest British & Irish Lions Test Series of all time. With unprecedented access to all areas of the Tour, Living with the Pride is the most intimate, honest and intense portrait of life as a Lion ever produced. From the Pennyhill Park training camp, to the magnificent final Test victory in Johannesburg, this is the inside story of how players, who are normally the fiercest of opponents, turned themselves into a band of brothers desperate to restore pride to the Lions jersey. Their grueling 10-match tour of the World Champions' back yard asked questions of the players' mental and physical strength like never before. British & Irish Lions legend and Head Coach Ian McGeechan worked closely with our film crew to make an astonishing no-holds-barred documentary with access to every player, an open door to every team meeting, training session, selection meeting as well as excusive access to the passion, fury and ultimately elation of the Lions dressing room. This is a unique and uncompromising insight into life on a Lions Tour, described by Tour Manager Gerald Davies as 'the last great adventure in rugby'. No Lions Series has ever been closer, with many commentators describing the second Test as 'the greatest rugby match ever'. Sometimes hilarious, but often brutal, bruising and moving, British and Irish Lions 2009 - Living with the Pride DVD is the official and exclusive behind the scenes story of one of the most exhilarating, emotional and memorable sports tours of all time. Of absolutely no interest to 99% of the world, but if you are interested in rugby, or like watching behind the scenes sporting documentaries, then this view into the lives of the British & Irish Lions tour to South Africa, the hardest full contact sport, in the hardest country, is a must. Not quite the 1997 groundbreaking Living with the Lions, but fascinating, awe inspiring and laced with some hilarious moments as can only be had by 40+ young fellas on tour. 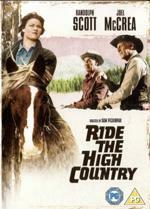 Hey, Jon, I have been planning on reviewing Ride The High Country myself...either in this marathon or in my ongoing (i.e. once-in-awhile) westerns marathon. I may still do it there but now I won't be in such a hurry to do it. I think thiw as Sam Peckinpah's second film as director...I recently did his first, The Deadly Companions...in this thread, I think. Well, please reconsider! I'd like to hear your thoughts on it as it quite surprised me. I will try to get to it soon as I do especially like Randolph Scott. I'm behind and doubt I'll get to all the letters of the alphabet by the end of the month so I may try moving around the alphabet randomly rather than go in order which is what I've done so far. I'm not at home today so I can't do any reviews today and I'm not sure about tomorrow as that is a dialysis day which often tires me out but we'll see. Of course, I could do some TV stuff to get through some letters quickly if it looks like I won't be able to finish with movies in time. Plot:Inspired by true events, The Hunting Party stars Richard Gere and Terrence Howard as vacationing journalists who try to track down a missing war criminal in one of Eastern Europe’s deadliest regions. What begins as an impulsive reporting adventure immediately turns dangerous, as hostile locals, shady underworld figures and a case of mistaken identity put them squarely in their target’s crosshairs. Amid the bullets and bombs, they discover that getting the scoop is one thing – getting out alive is something else entirely. Amazing due to the truth of the story, the fictional license (which is quite small) is rectified before the credits by displaying the few slight changes made. The 3 leads work very well together, and after a slow start the film really gets into its stride and is very watchable. An enjoyable and educational true modern day journalistic thriller, can't see anyone not enjoying it. Get ready for a gut-busting, outrageous comedy from the guys that created Shaun of the Dead>. Nicholas Angel (Simon Pegg) is a big-city cop who can't be stopped - but he's making[ everyone else on the force look bad. When he is reassigned to a small, quiet town, he struggles with this new, seemingly idyllic world and his bumbling partner (Nick Frost). But their dull existence is interrupted by several grisly and suspicious accidents, and the crime-fighting duo turn up the heat and hand out high-octane, car-chasing, gun-fighting, big-city justice in this hilarious hit critics are calling "Outrageous! Uproariously funny!" (Thelma Adams, US WEEKLY). This is my Z entry. I've been plagiarized!!! I was just at the home page where random reviews show up...and my review in this thread of "Angel and the Badman" was there...but it says the review was by...snowcat??? My lawyer's getting a call in the morning! Service in the Merchant Marine means saying goodbye, keep the home fires burning. It is loose lips sink ships, a convoy tiptoeing through a dead-thick fog. It is the ear-splitting clatter of ack-acks and cries of aircraft sighted, all hands. It is fear, bravery and just doing a job. It is the lifeblood of democracy's arsenal. This World War II salute to Allied forces that supply the war effort sweeps you into the action-filled voyage of a besieged freighter. Humphrey Bogart, a World War I seaman and an avid recreational sailor, stars as First Officer Joe Rossi who, along with his captain (Raymond Massey), matches tactics with U-boats and the Luftwaffe. The tactics are on target – so much that this became a Merchant Marine training film. There are two types of movies I always seem to enjoy. Viking movies and those with submarine battles (including U-571). I knew going into this movie I would enjoy it. I’m glad I wasn’t disappointed. It had been about a year and a half since the Pearl Harbor attack when this movie was made. Obviously you can expect it to be a piece that shows how great the allies are (especially the Americans). The last scene takes it a bit too far I thought but I guess at the time it was expected and even needed. The story was good but a bit predictable. Bogart does a great job as well (again, expected). My son (22) came in during one of the battle scenes, which looked like it was filmed in a bathtub. He laughed asked how I can even watch that “crap”. I got a bit of a chuckle out of it. When you think of all the work that went into movies back then that is now done sitting in front of a computer. Of course it looked like a bathtub – it was! (not exactly but you guys know what I mean). With little toy boats and airplanes. Add a few sound guys off to the side doing the sound effects and you’ve got a movie! I will keep this one in mind for a war movie weekend. I’m sure I could watch it again and enjoy it as much or more as the 1st time. A hurricane swells outside, but it's nothing compared to the storm within the hotel at Key Largo. There, sadistic mobster Johnny Rocco (Edward G. Robinson) holes up - and holds at gunpoint hotel owner Nora Temple (Lauren Bacall), her invalid father-in-law (Lionel Barrymore) and ex-GI Frank McCloud (Humphrey Bogart). McCloud's the one man capable of standing up against the belligerent Rocco. But the postwar world's realities may have taken all the fight out of him. John Huston co-wrote and compellingly directs this film of Maxwell Anderson's 1939 play with a searing Academy Award®-winning (1948: Best Supporting Actress.) performance by Claire Trevor as Rocco's gold-hearted, boozy moll. In Huston's hands, it becomes a powerful, sweltering classic. I said in the last movie there are two types of movies I know I’ll enjoy. There are also things in the movies that, when I see them I know I won’t like. One of them is hurricanes. Probably since I’ve lived in Florida for over 30 years and have seen at least twice that number of actual hurricanes hit or pass within 150 miles of me. Very rarely (if ever) do they get it right in the movies. This movie, like the rest, got it wrong as well however the hurricane was only there as a reason to keep everyone locked up and isolated. For that it worked. The before and after the storm passing part didn’t matter really. So fortunately I didn’t let it ruin the movie. 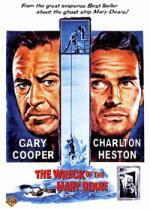 to let the bad guys get away and dump Bogart’s body overboard just as they had Cuba in sight. What they had was just a bit too predictable but still very enjoyable. Why did they have to have the entire storyline of Bogart getting married. Just to add a “dame” and have a musical number I guess. It really served no other purpose. It's not like without a wife to come home to he wouldn't have had the will to survive. 90% of the movie takes place in one room, again showing just how talented the actor’s are. There was not one time when my mind wandered or I began to lose interest. Very good movie and highly recommended. I love Key Largo. I know what you mean with the faults (less so the hurricane, being in the UK! ), but it comes from a time when dialogue still had a poetic edge to it. Me too. But then I love pretty much everything with Bogart & Bacall in it. 90% of the movie takes place in one room, again showing just how talented the actors are. A very similar and perhaps even better movie is "The Petrified Forest", made about 10 years earlier. Bogart plays the villain here; IIRC it was his breakthrough role. No Bacall, but a pretty great Bette Davis.